Free Range Duck and Goose Eggs! Goose eggs are larger than duck eggs - at least twice the size of a chicken egg. They can also be used any way a chicken egg is used. Since their yolk-to-white ratio is higher than that of a chicken egg, they produce heavier, moister, denser baked goods. If it adds too much moisture and denseness, you can offset this by adding an extra egg white. Goose eggs are very creamy and richly flavored. Even more so than a duck egg in our experience. Some chefs particularly prize goose eggs for making pasta, where the flavor from those extra-huge yolks is highlighted by the extra bouncy texture achieved with the protein-rich whites. 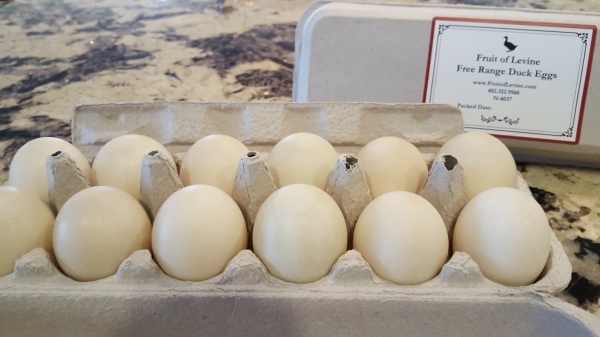 don’t lay as many eggs as ducks or chickens in a season, so our quantities of goose eggs are very limited. Since our birds are free range, their eggs will contain less cholesterol, less saturated fat, more vitamin A, more omega-3 fatty acids, more vitamin E, more beta carotene, and more vitamin D than an egg that is not free range! AND the birds are much healthier and happier, eating as many fresh greens and insects as they want which gives them an extremely varied and healthy diet all day long. Duck eggs are higher in protein, calcium, iron, potassium, and other major minerals than chicken eggs, along with a higher concentration of omega-3 fatty acids. They have a much larger and richer yolk which will also be more orange than a chicken egg. The duck egg whites are almost transparent, without the yellowish tint of chicken egg whites. Duck eggs will be slightly larger than chicken eggs with a thicker shell. Duck eggs fry well, poach well, and boil well. You will find them much creamier and richer than chicken eggs. Duck eggs are excellent to use for baking. Raw duck yolks are thick, rich, and custardy and the whites have more protein than chicken egg whites. For these reasons, many pastry chefs prefer to use duck eggs when baking and making cream and custard fillings. Your baked goods will have a richer texture, stay moist longer, and rise higher. When baking gluten free, try duck eggs. The added protein in the whites will help bind the gluten free ingredients better and cause the texture to be lighter, fluffier, and more like wheat based cakes and other baked goods.